At least 1257 people were detained, with 264 of them put under arrest, in operations targeting the Gülen group and Turkey’s Kurdish minority in the first 15 days of May, according to data compiled by Turkeypurge.com. The detentions, arrests and dismissals took place between May 1 and May 15. On May 1, Turkish police teams detained 16 academics from the Diyarbakır-based Dicle University who were sacked from their jobs under a government decree issued. On May 1, access to archived copies of the journals, magazines and the newspapers that were shuttered as part of Turkey’s post-coup emergency decrees were restricted as the National Library was ordered by the government to blacklist such publications. On May 1, at least 165 individuals were detained during the celebrations held across Turkey to mark May Day, according to the İstanbul Security General Directorate. On May 2, Bursa police rounded up 7 teachers after a raid against a central bookstore in the city. On May 2, Ayşenur Parıldak, a former reporter from the now-closed Zaman daily, was re-arrested by an İstanbul court hours before leaving prison upon a prosecutor objected to the initial ruling. On May 2, an indictment prepared by an İstanbul prosecutor sought three years sentence for Mümtaz’er Türköne, a political science professor and columnist for now-closed Zaman daily on charges of “threatening Turkish President Recep Tayyip Erdoğan” in a column February 2016. On May 2, Turgay Karaman, the principal of Time International School in Ipoh, Malaysia, was abducted by unidentified persons as he left his house for a meeting in Kuala Lumpur on Tuesday. On May 3, twenty-two staff members at the Kocaeli Police Department were detained as part of an investigation targeting alleged followers of the Gülen group. On May 3, an indictment drafted by the Ankara Chief Public Prosecutor’s Office sought a consecutive life sentences and additional jail sentence of up to 10 years for Turkish comedian Atalay Demirci on coup charges. On May 3, Ekrem Türk, a 34-year old police officer who reportedly fought to prevent the advance of army tanks in Turkish capital on the day of failed coup bid of July 15, 2016 was rounded up while he was getting treatment at a private hospital in Ankara. On May 3, Turkish government seized a local convenience store, called Sezer Gida in Mardin’s Kiziltepe district over its alleged links to the Gulen group and appointed a trustee panel to take over the management. On May 3, A.A., a 2nd degree police officer until he was dismissed under a post-coup government decree, was shot in his leg and detained by his former colleagues in Ankara. On May 4, Mehmet Güleş, a reporter for the Dicle New Agency, which was closed by the government following a coup attempt in Turkey on July 15, was sentenced by a court in Elazığ province to nine years, four months and 15 days in prison for alleged membership in a terrorist organization and disseminating the propaganda of a terrorist organization. On May 4, Turkeypurge.com received an e-mail that revealed that eleven Turkish nationals who were reportedly detained in Saudi Arabia on March 15 have been kept in a hotel in Madinah for weeks, waiting to be deported to Turkey. On May 4, at least 98 people including teachers, doctors, military officers and small business owners were detained as part of an investigation into the Gülen group. Police carried out operations in Izmir, Ankara, Aydın, Manisa and Antalya provinces; and took into custody 98 suspects who are accused of giving financial support to the group. On May 5, at least 32 teachers who were earlier dismissed from their posts were taken into custody in Kayseri province as part of an investigation into the Gülen group. On May 5, detention warrants were issued for 72 people who used to work for the now-closed Süleyman Sah University as part of an investigation into the Gülen group. On May 5, a report released by the Diyarbakır branch of the Human Rights Association (İHD) revealed that a total of 7,907 rights violations took place in Turkey’s predominantly Kurdish Southeast in the first three months of 2017. On May 5, Turkey’s top judicial body, the Supreme Council of Judges and Prosecutors (HSYK), dismissed 107 more judges and prosecutors over alleged ties to the Gülen group. On May 6, three more Turkish journalists were sent to prison on charges of “disseminating terrorist propaganda” and “membership in an armed terrorist organization,” the T24 news portal reported. On May 6, O.G., a lawyer representing his colleague D.U. who was earlier detained for his/her alleged use of mobile app ByLock, was taken into custody over same charges. ByLock is a smartphone application that Turkish authorities claim to be the top communication tool among followers of the Gülen group. On May 7, at least 34 people were detained during demonstrations to mark 44th anniversary of Deniz Gezmiş and his friends’ execution by the government on charges of attempting to overthrow the constitutional order in 1972. Three student leaders Deniz Gezmiş, Yusuf Aslan and Hüseyin İnan were hanged at a prison in Ankara’s Ayaş district for attempting to overthrow the constitutional order as an junta-backed government voted to approve their death penalties, just two years after the 1971 military coup. The three have become rallying figures among leftist circles since their deaths. On May 7, Turkish Justice Minister Bekir Bozdağ said 149,833 people have been investigated and 48,636 have been jailed as part of an investigation targeting the Gülen geoup since a July 15 coup attempt in Turkey. On May 7, Ahmet Tevfik Uzun, a former Justice and Development Party (AK Party) deputy, was taken into custody as part of an investigation into the Gülen group. On May 8, the Bingöl Governor’s Office declared a curfew in 20 villages and at least 83 neighborhoods in the eastern province of Bingöl as part of operations against members of the Kurdistan Workers’ Party (PKK). 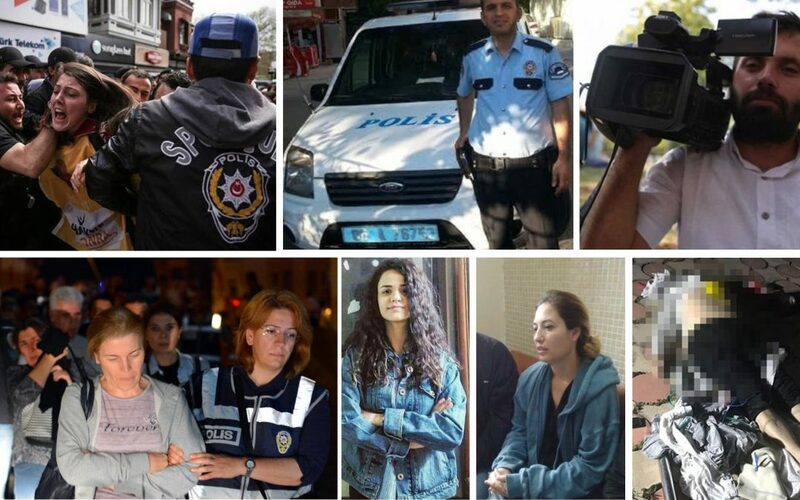 On May 8, Turkey’s Interior Ministry announced that a total of 891 people were detained in operations targeting the Gülen group while 41 were detained due to their posts on social media between May 1-8. On May 8, a Turkish prosecutor demanded 3,623 aggravated life sentences for US-based Islamic scholar Fethullah Gülen, the pro-gov’t Yeni Şafak daily reported. On May 8, A university student was sentenced to house arrest for insulting Turkish President Recep Tayyip Erdoğan by retweeting a tweet. According to senfika.org, Kardelen Aritman was detained early on May 8 by police after she retweeted a tweet that allegedly insulted the president. Later the same day, she appeared in an Adana court, where a judge sentenced her to house arrest with a curfew. On May 9, Forty out of 61 people who were detained in İstanbul while in hiding because of an ongoing government witch-hunt targeting the Gülen group were arrested. On May 9, at least 16 people who work for Eskisehir Osmangazi University (ESOGÜ) were detained as part of an investigation into the Gülen group. On May 10, the 59-years-old Turkish writer, Mustafa Hikmet Kayapalı passed away after falling from a three-storey-building as he was reportedly attempting to escape a police raid as part of an investigation into the Gülen group. On May 10, Turkish border agents detained the responsible manager of the now-closed TV10 TV station at İstanbul’s Sabiha Gökçen Airport with her one-year-old baby upon her arrival from Germany. On May 10, French photojournalist Mathias Depardon was detained after photographing the local scenery in Turkey’s southeastern Batman province. On May 11, a total of five judges who were dismissed from profession with decrees issued by the Turkish government in the aftermath of a coup attempt on July 15, 2016, were arrested. On May 12, Oğuz Güven, the internet editor of the opposition Cumhuriyet newspaper was detained by police. “I am being taken into custody,” Güven tweeted without elaborating on the charges raised against him. On May 12, three Turkish nationals detained over controversial charges in Malaysia were deported to Turkey, according to police chief Khalid Abu Bakar. Malay police detained Turgay Karaman, the headmaster of a Turkish school in the city of Ipoh; businessman İhsan Aslan and academic İsmet Özçelik over their alleged links to the Islamic State of Iraq and the Levant (ISIL), last week. Abu Bakar tweeted on Friday that Turgay Karaman, Ihsan Aslan and Ismet Ozcelik had been deported back to Ankara on Thursday night. Amnesty International, Human Rights Watch and UN Human Rights Office for South-East Asia earlier called on Malay officials to refrain from extradition as the detainees are affiliated with the Gülen movement, which the government has launched a sweeping witch hunt against, accusing the group of being behind the July 15, 2016 coup attempt. Even though Malaysian government underlined that the trio were detained over alleged ISIL links, human rights organizations shared their concerns over the possibility that Malay officials are going after Turkish nationals at Turkey’s request. On May 12, detention warrants were issued for 102 people as part of an investigation into the alleged sympathizers of the Gülen group. On May 13, nine people who used to work at dormitories and schools closed by the government over ties to the Gülen group in Kayseri were sentenced to jail terms of between 3 years and 9 months to 7 and a half years. According to state-run Anadolu news agency, the suspects identified with initials A.Ç, H.A, O.K, S.C and T.S received jail sentence of 6 years and 3 months each; N.G. and S.Y. 7 years and 6 months each; M.D. 6 years and 3 months; and M.M.D. 3 years and 9 months. On May 13, a total of 50 noncommissioned officers in 14 provinces were detained by police over links to the Gülen group. According several Turkish media outlets, as part of the investigation based in Edirne province, simultaneous raids were conducted in 14 Turkish provinces on Saturday morning to detain the officers. On May 14, Önder Asan, a private school teacher who was allegedly abducted by unidentified people in April 1, turned out to be in police custody in Ankara Police Department’s Bureau of Organized Crimes, his wife said.